Las Sombras/The Shadows. Photographs by Kate Breakey. Published by University of Texas Press, 2012. Photographs by Kate Breakey. Introduction by Lia Purpura. University Of Texas Press, Austin, 2012. Hardbound. 168 pp., 100 color illustrations, 12x12". Kate Breakey follows in the footsteps of major figures in the history of photography. In her latest monograph Las Sambras, aka The Shadows, she makes a series of cameraless photographs. These photogenic drawings, otherwise known as photograms, are made by placing objects onto light sensitive paper. She borrows stylistically from the grandfather of photography William Henry Fox Talbot, and also from Anna Atkins, an English botanist and photographer who published what some consider to be the first book of photographs. These artists made major contributions to the history of photography, so of course, I was excited to see what Breakey had to offer. 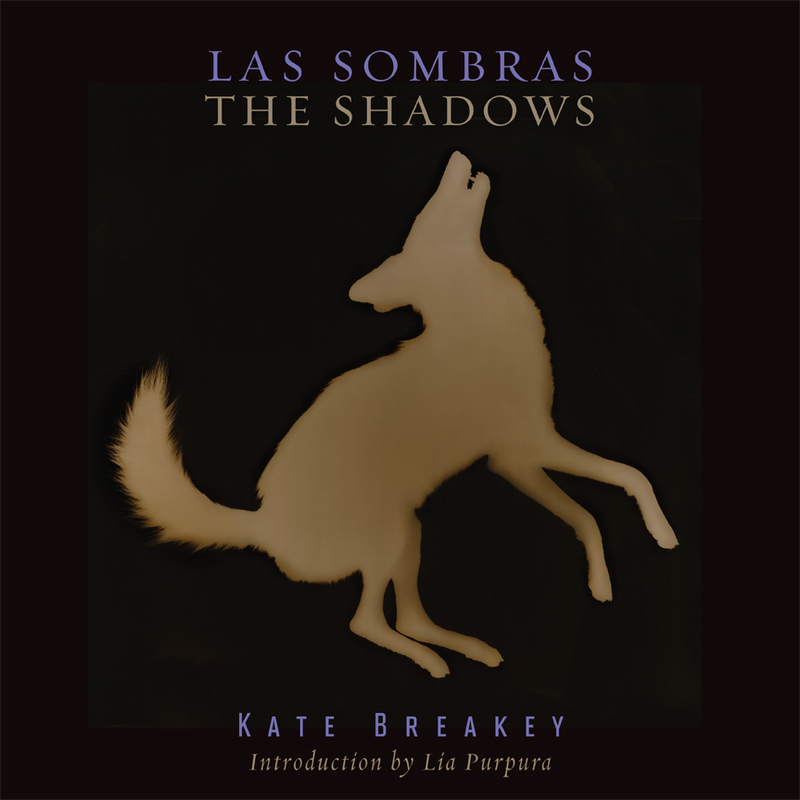 Las Sombras/The Shadows, by Kate Breakey. Published by University Of Texas Press, 2012. Kate Breakey makes pretty pictures. They are whimsical, fantastical and sometimes enigmatic, but mostly they are just pretty. She makes most of these images using dead animals, but we don’t see the evidence of death. Instead we see bunnies frolicking and foxes dancing. She shows us beetles, bats, and bobcats. We are confronted with the shadows of creatures we would otherwise avoid such as scorpions, snakes and skunks. Breakey playfully arranges foxes fowl and fauna, demonstrating her love and fascination with wild life of the American Southwest. I can't help but compare her photograms to those made by Adam Fuss. Fuss transforms the grotesque elements of death into something visceral, surreal and beautiful. Breakey gives her audience respite, or an escape into a world where animals are reanimated in a series of simple narratives that remind me of Aesop’s fables or children's stories. A majority of the images in this book are high contrast, sepia toned prints. Occasionally, Breakey presents a blue, cyanotype image, which is a refreshing and welcomed change. She stays true to the scientific roots of this process by providing a list of data, classifying and identifying each of the specimens she documents. She indicates the scale, the common name, and the specific genus and species of each animal. DANIEL W. COBURN lives and works in Phoenix, Arizona. Selections from his body of work have been featured in exhibitions at the Los Angeles Center for Digital Art and the Chelsea Museum of Art in New York. Coburn's prints are held in many public and private collections including the University of New Mexico Art Museum, The Mulvane Museum of Art, The Albrecht-Kemper Museum of Art, The Mariana Kistler-Beach Museum of Art and the Moraine Park Museum. His writings and photographs appear regularly in regional and national publications including Fraction Magazine and Photo-Eye Magazine. Coburn recieved his BFA with an emphasis in photography from Washburn University where he was the recipient of numerous honors including the Charles and Margaret Pollak Award. He received his MFA with distinction from the University of New Mexico in 2013.